The Next Stage: Women and Retirement: Are the tea party folks giving “socialism” a good name? Are the tea party folks giving “socialism” a good name? A few weeks ago I heard a story on NPR about Americans’ changing attitudes towards socialism. I was surprised to hear that 36% of Americans and 53% of Democrats have a positive impression of socialism. I thought I must have misheard, so went to the Gallup website and sure enough my ears had not deceived me. No surprise, the terms free enterprise and capitalism had much more positive ratings (86 % and 61%respectively). However, I didn’t expect the favorable responses for socialism to be this high given the way the term has been demonized and given that no elected officials holding national office (except for Vermont’s Bernie Sanders) have embraced the term. So what gives? I decided to check other polls to see if the Gallup poll was an outlier. An April 2009 Rasmussen poll showed even higher favorable responses for socialism—a story I somehow missed. Something is going on here. Perhaps when those who like President Obama hear all these ( ridiculous) charges that Obama is a socialist, instead of feeling less positive about Obama, they feel more positive about socialism? 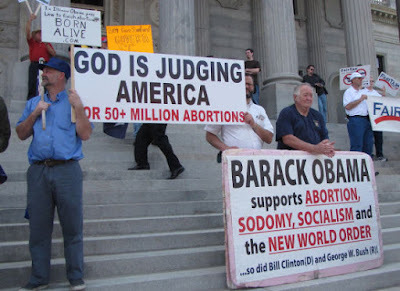 Those who find the tea party crowd small-minded and mean-spirited might think if these guys think socialism is so awful, then maybe it’s not that bad after all. What just about all polls have found is that Americans don’t pay much attention to complicated public policy debates. Most are stressed out, overworked, struggling to keep their heads above water. They don’t have much time (or inclination) to pay serious attention to politics. But when folks hear ideas grouped together over and over again, unexamined associations can form. The Obama = socialism craziness of the far right might just be having the unintended consequence of making the word socialism a lot less scary! Smart, smart post! Glad I checked in today. Hope you don't mind if I act as internet docent and point a few folks toward this one. Garrison Keillor has written one of his stream-of-sanity fantasies on the subject of the Tea Set that I loved so much, I just re-printed it this morning along with some fun images. Let me know what you think. Please send link to Garrison Keillor post. Oops, sorry I missed this! Just go to http://www.maturelandscaping.com and look for February 23rd post, "Politics Can Be So Cheesy." Enjoying your blog!